It’s a politically charged time to be alive in the US. Yesterday’s Women’s March brought out incredible numbers of people in cities and towns around the world who exercised what we consider a fundamental right in America. Maybe you had your young children with you, like I did. I realized while we were marching in a local protest that activism can be a hard thing to define to young kids. 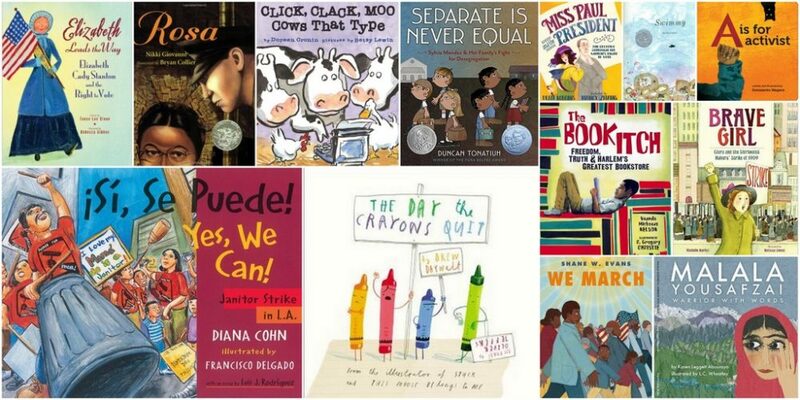 Keep the conversation going with these books that help explain and demonstrate what it’s all about. The Day the Crayons Quit by Drew Daywalt. The crayons are fed up, and they’re going to let Duncan know exactly why. Show kids the power of letter writing, how a strike can help you fight for your rights, and the power of listening when you’re in charge. Click, Clack, Moo: Cows That Type by Doreen Cronin. The barnyard animals start with a politely typed request to the farmer, but when he ignores them, they take peaceful and hilarious action. Never cross a cow with a typewriter. A Is For Activist by Innosanto Nagara. An absolutely gorgeous alphabet book teaching some of the basics of social justice, too. Rosa by Nikki Giovanni. This book is gorgeous, and packed with information about Rosa Parks and the bus boycott. The text of her story may work better for kids in maybe 2nd grade and up, but the amazing Bryan Collier’s illustrations (honestly, we are not worthy) and essence of what Ms. Parks’s protest was about can come through for any age if you talk it out with them. ¡Sí, Se Puede! / Yes, We Can! by Diana Cohn. A bilingual story of a successful janitors’ strike in LA, this one focuses on young Carlito. He’s trying to figure out how to support his mom, a janitor fighting for better wages. His teacher helps him figure out how to write a powerful protest sign. Brave Girl: Clara and the Shirtwaist Makers Strike of 1909 by Michelle Markel. Clara Lemlich was a young Jewish immigrant from Ukraine who led the biggest women’s worker strike in US history. Girls and immigrants have power, have a voice, and can bring about change. Separate Is Never Equal: Sylvia Mendez and Her Family’s Fight for Desegregation by Duncan Tonatiuh. This one brought in a Pure Belpre Honor and a Robert F. Sibert Honor in 2015, and it’s a powerful book for teaching the impact of organizing and using the law to your advantage. Malala Yousafzai: Warrior with Words by Karen Leggett Abouraya. Malala’s famous story of being shot by the Taliban and becoming even more outspoken for girls’ right to education is kind of a scary one to share with preschoolers. But, she’s such a powerful role model who used her voice at a young age to bring about change. This book finds a balance that’s just right for young children without being too scary. Swimmy by Leo Lionni. Swimmy is different from all the other fish he knows, and this has caused him some hardships. But being different can also be amazing, like when he teaches a band of fish how to work together to beat a big, scary bully fish. We March by Shane Evans. The 1963 March on Washington for Jobs and Freedom brought record numbers of peaceful protestors to DC. And ended with Martin Luther King, Jr’s iconic “I Have a Dream” speech. Kids may have heard about the speech recently for MLK Day, but this will help explain what the marching itself was all about. The Book Itch: Freedom, Truth, and Harlem’s Greatest Bookstore by Vaunda Micheaux Nelson. Lewis Michaux, Sr. created a safe space where people could read and talk about how to change the world, a famous bookstore that drew celebrities and people from all over. Pretty powerful stuff, the power of books and the right to assemble. Elizabeth Leads the Way: Elizabeth Cady Stanton and the Right to Vote by Tanya Lee Stone. Stanton is the suffragist credited with really starting the women’s right to vote movement in the US. The movement was problematic because it failed to represent women of color at the time, and it’s worth talking about that with kids. But this book will still help kids understand the power of speaking up and speaking out for equal rights. Miss Paul and the President by Dean Robbins. Alice Paul was a suffragist and activist who managed to win over President Woodrow Wilson for the women’s right to vote after she organized a parade that upstaged his inauguration, got arrested, and met with him personally in the White House. She continued the work of Elizabeth Cady Stanton that eventually led to the 19th Amendment, and this book perfectly explains her cause and what she accomplished for a very young audience. For anyone who dismisses protesting, or the power of women to organize, march, and fight for their rights, Paul’s story is a great reinforcement for young kids learning how to stand up and be heard.